AshleyNewell.me: Caffinated Cropper RELEASE DAY!! Are ya'll ready for a BRAND NEW Caffinated Cropper kit?! I hope so but today is the release of Pocket Full of Sunshine! Oh my goodness! This kit is so bright and fun! I love it! Wow! Isn't that AMAZING?!? This kit is super versatile. 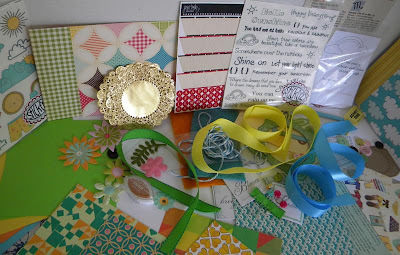 To purchase this kit, you just go over to AMY'S BLOG and there is a Paypal button to purchase it on her right sidebar. You can also get a bundle with Birds of a Feather for only $50! We also have TWO new guest designers for this month, Jessica Diedrich and Stephanie Zito! These girls are AWESOME! First up is a typical bright and sunny "Ashley" card. :) Teehee! The only thing I added to this card that isn't in the kit is the white card stock. I used the My Little Shoebox paper for the background. The main image and sentiment are for the two Stickerz sets from EAD. The frame is LYB, doesn't it look like Nesties Lable 1? I think so! And the ribbon and the buttons are also from the kit. 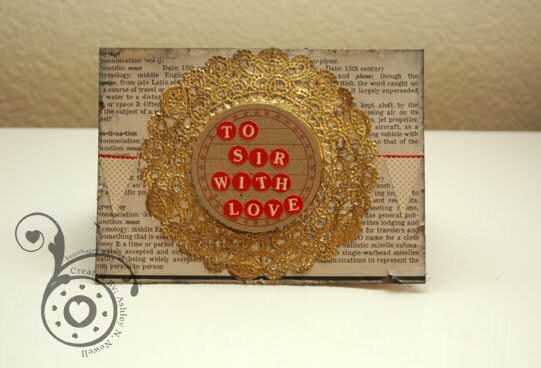 Ok, and now here's my vintage-y, masculine kind of card. I know, right? Didn't think you had it in me, did you? Isn't this a completely different look? It's with the SAME kit! I did "dirty" it up a little bit though. I took the newspaper, distressed it and then inked the edges with some black ink from my stash. Then I took one of the gold doilies and painted it some Mocha Latte Creative Inspirations Paint to age it a little bit. I spelled out the sentiment (in my head because of the season finale of Glee) with the Jenni Bowlin stickers and used some of the banner stickers from the same sheet. Check out the DT!! There's gonna be some fabulous inspiration! 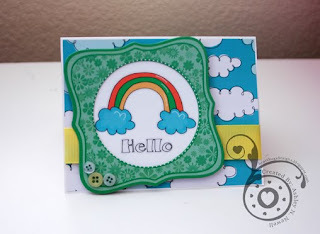 SUPER adorable, amazing cards, girlie! Thanks for having me along for the ride this month-I am so stoked! OMGosh Ashley! The cards are just fabulous and just love both of your cards. Thanks for the inspiration. Both cards are totally fabulous!! Wow!!! Amazing cards Ashley!!! Love how both of them are so different! I'm super excited to be working with you this month! That is one of my 14year olds' favorite movies..which I'm so going to have to watch one of these days...I really love both of these cards Ash!! Love how you showed the versatility of the kit! Thanks so so much!! great cards! fabulous that there is such variety in the kits!